Dia Compe old school BMX brake set with quick adjusters. Excellent condition. Dia Compe . Shipped with USPS First Class Package. Nos. See pics. 1980’s brake cables. DIA-COMPE rear center pull brake cable casing stop bracket. About Mike Fraysse Sports: Since 1994, Fraysse has operated Mike Fraysse Sports, LLC., a cycling- and triathlon-specific training center located in the foothills of New York's Catskill Mountains just 2 hours from New York City and 3 hours from Philadelphia. DIA COMPE BULLDOG -WHITE. REAR.GREAT SHAPE/LITE SCUFF. CLEAN THREADS. GOOD SHAPE. LITE SCUFF. NO HASP/HINGE. HERE WE HAVE A LOT OF BMX LEVERS. DIA TECH TECH 99- FRONT. New in box. no stradle cables included. PLEASE READ COMPLETE DESCRIPTION. SEE ALL PICTURES Up for bid is a nice, 07 16 85 DIA COMPE STAMPED RED BRAKE HOUSING WITH BRAKE CABLE.. HOUSING IS JUST UNDER 20" IN LENGTH. THIS IS PERFECT FOR A FRONT BRAKE. HOUSING AND CABLE HAVE TONS OF LIFE LIFT IN THEM AND WILL GO GREAT ON THE BMX PROJECT YOU HAVE OR WILL HAVE GOING. Ask any questions. See other listings. See all pictures. If more pictures are needed please ask. Shipped with USPS First Class Package. Pre-Owned MX 900 Brake Caliper and pads. In Good Condition. I don't think it was mounted very long as it was on a gold 1981 dia comp mx 900 that was mint except for very minor brake rub on the pads. Dia Compe MX1000 Brake. This is a used original old school BMX Dia Compe MX1000 brake caliper. Made in Japan with 1980 date stamp. Dia Compe MX1000 Brake. This is a used original old school BMX Dia Compe MX1000 brake caliper. Made in Japan with 1983 date stamp. Dia-Compe 5583 Model. You are buying a gently used in excellent condition early 1980's Dia-Compe Blue Anodized Brake Set. Calipers and Levers. Blue Anodized. Kool blue anodized Cruiser/BMX brake set and in quite nice condition. 986 brake ONE brake no mounting bolts. 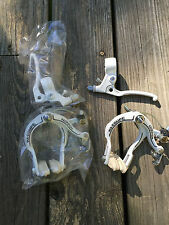 Dia Compe cantilever brake set (for 1 bike). Multiple quantities. See pics for general condition. Actual set may have rust and scratches from use. Vintage DIA-COMPE Top Tube BRAKE CABLE GUIDE Set STAINLESS STEEL Clips 1970’s ! These have been in a drawer since the late 1970’s. They are new, never installed. I have several sets of 3. Maybe you could use them. NOS Dia-Compe 890 Front Brake Caliper with possible shelf ware. Missing most of the hardware except what is pictured. 1183 date stamped. Expect dust and dirt. NOS WHITE FORMOS 1000A FRONT CALIPER LEVER AND CABLE. YOU WILL RECEIVE THE EXACT ITEM YOU SEE IN THE PHOTOS. Various pieces, really not sure what may be missing. 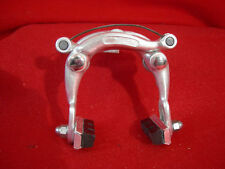 Schwinn Collegiate Approved Dia Compe LS 2.8 rear brake caliper in very good condition. Complete with all original hardware. Brake pads have very little wear. Finish is mildly aged. This Caliper is intact with “most” of its OG hardware. I replaced one of the acorn nuts. Caliper is Stamped 5583 Japan. This is not a repop. BMX PLUS- your source for 80's old school bmx and freestyle parts. Rear nutted. Max reach 57, Min reach 45. Color: Red. Condition: New and never used. These were made in Japan. This item is used but is in really good condition overall. Dia Compe MX1000 Brake. This is a used original old school BMX Dia Compe MX1000 brake caliper. Made in Japan with 1982 date stamp. CABLE STAMPED:"DIA COMPE'"'08 05 83". BMX - FREESTYLE - BMX. Doing that is against U.S. and international laws. For that I am grateful. You all have been so nice to work with. Still in the original box and never used. Dia Comp 'Gran Compe' side pull brakes. Nos Black front and rear Dia Compe bmx brake cables. Unopened. Both dated 85. Needs cleaning. Has scratches and wear. Great for 70s-80s build I have been involved with BMX over 30 years and have sold many items over the years to all over the world. Please contact me if you have any questions. Excellent Original Survivor Set! All original Hardware,See pics for complete condition details. This would be good for your 1980's BMX bike or any year! DIA-COMPE MX 1000 REAR BLACK. 0482 PRINTED ON THE BACKSIDE OF ARM, I believe that makes it made in 1982. These brakes are in excellent condition. They are gold in color but are faded. I used these brakes on a Schwinn 26" wheel bike. All of the brake pads are in pretty good shape and they are all Dia Compe brake pads. The quick releases are in good shape and not bent. BMX - FREESTYLE - BMX. STAMPED:"883'"' DIACOMPE". Doing that is against U.S. and international laws. MAY HAVE SLIGHT STORAGE MARKS. For that I am grateful. You all have been so nice to work with. Included are 8 caliper arms total and 5 original springs, from which you can build three sets. 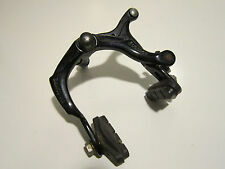 DIA-COMPE 500 vintage bicycle front Brake Caliper & rear Brake Caliper set.